I refill my printer toner y and M. after refill it was still complains empty cartridge. Why after refill?. Sometimes the printer struggles to read the cartridges. This doesnt mean they are empty. you may want to try and wipe the chip on the cartridge and reinstall them. This may help them be read better. our team on 0161 968 5994 and someone will be able to go through this with you. The Konica Minolta Bizhub C25 office colour printer offers multifunction capabilities while maintaining its small design. It is a step above many other multifunction units, as it supports colour printing, unlike mono lasers that can only print black and white. Additionally, the Konica Minolta Bizhub C25 multifunction printer can scan, copy, and fax at respectable speeds and with excellent output quality. However, the Bizhub C25 MFP only offers low-resolution colour printing at 600x600 dpi. 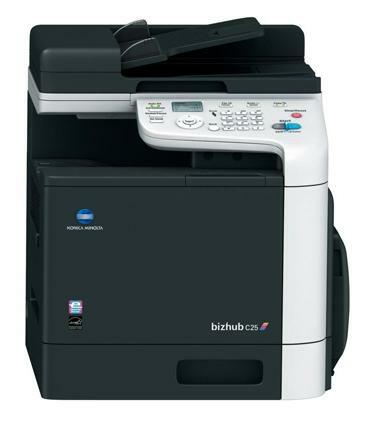 The Konica Minolta Bizhub C25 compact colour printer has a sleek black and white design. It features its own automatic document feeder, which allows easy scanning of multi-page documents. The device has a comprehensive control panel and a high capacity input cassette, which allows high-volume printing. The Konica Minolta Bizhub C25 colour laser printer is designed for heavy-duty printing, with a maximum duty capacity of up to 120,000 pages per month. The Bizhub C25 laser printer has excellent connectivity and is capable of network sharing. Each of the four separate Bizhub C25 toner cartridges can print approximately 6,000 pages. The Konica Bizhub C25 printer offers good black and white print results, but coloured documents have lots of room for improvement. The Konica Minolta C-25 colour copier has a maximum paper capacity of up to 850 sheets, which guarantees better productivity. This multifunction powerhouse is also capable of scanning directly to PC, USB or network folders and email addresses and it supports a wide range of file formats. PC faxing is an option, while users have many secure printing choices to protect their documents. The Bizhub C25 all-in-one, on the other hand, prints low-quality colour pages and has average print speeds, able only to produce up to 25 black and white or colour pages per minute.